What are the origins of shockwave therapy? According to the International Society of Medical Shockwave Therapy, the technique dates back to World War II. Throughout the war, Germany was involved in a lot of water bombings. They found many castaway bodies with punctured lungs. They deduced that shockwaves from the water bombings had interfered with the human body. There was no other identifiable reason for the injuries. Therefore, this lead to the creation of the first shockwave machine in the 1970s. This was called the “focus shockwave therapy” and was utilised to treat kidney stones. A good success rate was experienced with the machine. As a result, the machine was used to treat different body parts to evaluate the effects of shockwaves. In these early times, the characteristics of the machine were altered. Then they began using the radial shockwave machine. This is the machine that we now have in Core Physio practices today. Shockwave involves the transmission of shockwaves. These are acoustic waves that move through the transmitter into the human body and affect the tissues at a cellular level. What are the common conditions that can be treated? 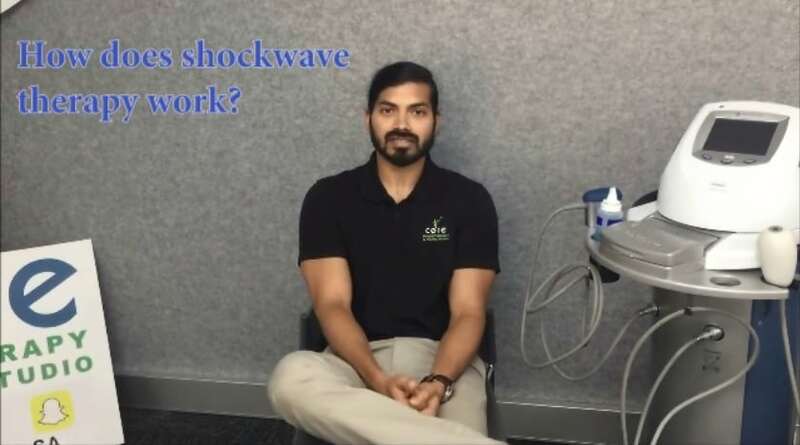 If you would like to learn more about shockwave therapy and how this treatment may help you, find the nearest Core Physio practice. Call the clinic to book an appointment.